RollaDome All Skate, a Registered Charity that offers roller skating throughout the UK. 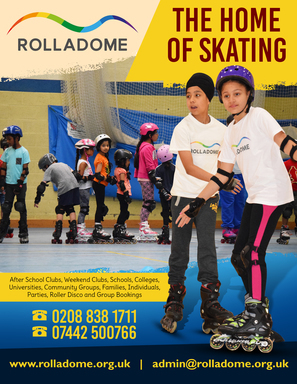 With everything from first-time roller skating lessons, roller skating clubs with coached training sessions to Roller Sports, RollBall, Figure Skating, Quad Hockey, Speed Skating, Skate Fit and Roller Derby! RollaDome All Skate introduces roller skating in a fun and relaxed environment, and there is more than roller skating available. We also have Young Leader’s Programmes, DofE, Sports Leaders training, and proud to boast our Media Team. Our Media Team is further developing Young Peoples Skills and experience, whilst providing services to communities. With everything from Film Production, Photos Shoots, Music Production, training and employability skills, just to name a few.